Inbound marketing continues to be the lead generation priority of modern brands but the nature of this broad strategy is constantly changing. New platforms are always emerging, the technology powering them is advancing at an increasing rate and the way your target audience interacts and buys from brands like you is evolving every year. In this article, we’ve got 10 actionable inbound marketing statistics for you that are going to impact your success in 2018 and beyond. We’re not talking about superficial numbers here, but key findings and what this means for your inbound marketing efforts over the coming years. This is a big one. In 2017, search overtook social media as the main source of traffic for the first time since 2014. This is a major reversal of priorities for inbound marketers who have been focusing on social media as their main source of traffic – something that needs to change in 2018. According to research from Shareaholic, 34.8% of traffic came from search in 2017, compared to 25.6% from social. Pinpointing why this has happened will take time but one reason could be Google’s move to include social content in search results and the drive of AMP content as a news source. Either way, it’s important for marketers to keep on top of their traffic sources and adjust their strategy to maximise incoming traffic. Always aim to publish your content where it’s most effective and in the format that gets the best results on each platform. With search driving more traffic than social, there’s going to be a natural shift back towards search engine optimisation in 2018. One thing that hasn’t changed over the past four years is the importance of link building for SEO and 65% of marketers say this is the most difficult strategy in organic SEO, according to Advanced Web Ranking’s SEO stats report 2017. If anything, link building has become more difficult over the years but the idea of building links (so to speak) doesn’t really cut it in 2018. Now, you have to earn links with content that people actually want to, you know… link to. It’s not the quantity of links you have that really matters, either. It’s the quality of your link profile that tells search engines you’re a publisher that should be ranking highly. So focus your attention on producing content that has real value to offer and promote in the places where people are going to engage with it most – across search and social. According to HubSpot’s State of Inbound 2018 report, 55% of marketers say blog content creation is their top inbound marketing priority. This reinforces the previous point about creating content that earns links (as well as likes and shares) to maximise your reach and bring in the volume of inbound leads you’re looking for. 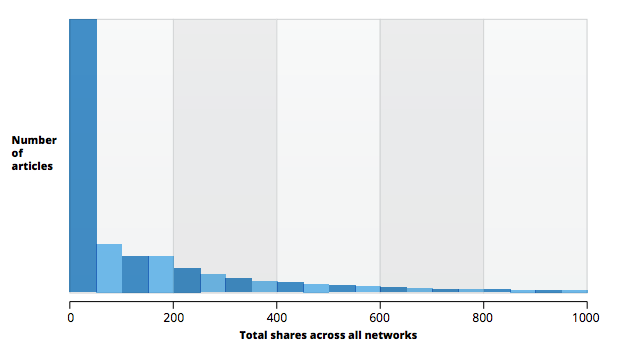 At the same time, research from Moz tells us that that vast majority of blog posts get zero links from other domains. A quick look at the kind of content your competitors are producing and it won’t be a surprise to hear most of it isn’t earning any links from external sources. Not a single link; nothing. You need to make sure your content is good enough to be in the significant minority of stuff that’s earning multiple quality links from sites with a strong search presence and relevance to your brand. There are a lot of reasons content might not generate the required number of links to add value but one thing that certainly won’t help is the fact that 70% of marketers lack a consistent or integrated content strategy – according to Altimeter. This is a big one: B2B overwhelmingly favour influencer content and this is a major trend for marketers in 2018. We also know this is applicable to B2C marketers as well, as proven by the rise and sustained success of influencer marketing on social media. So, if you want your content to make an impact, get the influencers on board and feature them in your content. DemandGen’s 2017 Content Preferences Survey Report reveals a massive 87% of B2B buyers trust industry influencer content more than anything else. The study also shows, once again, that buyers (68%) give more credence to peer reviews, third-party publications, and user-generated feedback while 66% trust content authored by a third-party publication or analyst. In terms of social marketing, LinkedIn is still the top choice for B2B marketers with 93% saying it’s the most valuable social platform, according to research from Smart Insights and Clutch. LinkedIn isn’t any slouch when it comes to B2C marketing with 74% of B2c marketers saying the platform is a valuable part of their social efforts. According to the same study, 82% of B2B marketers say Facebook is an important platform for their inbound strategies. However, the network is still considered more valuable by B2C marketers with a massive 96% saying it’s a valuable source for lead generation. 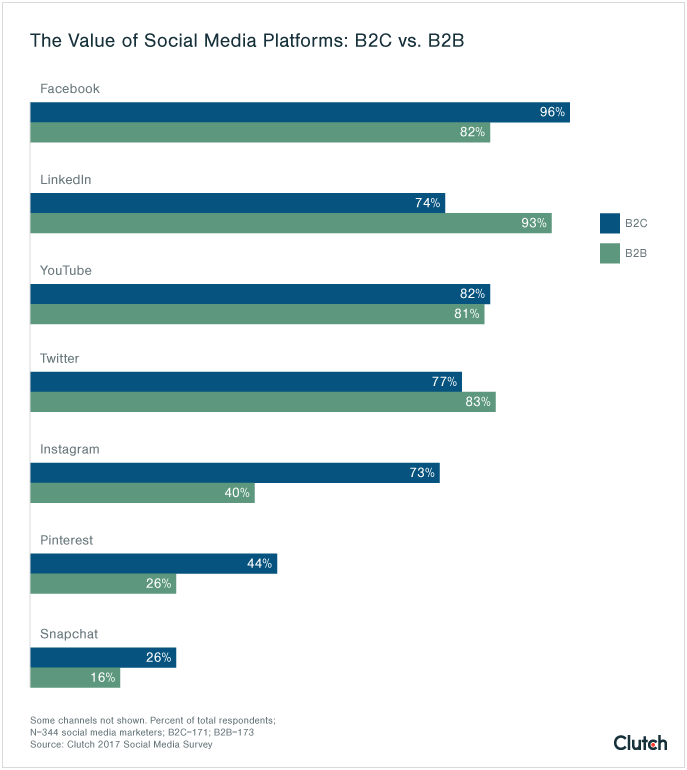 These figures also suggest that social media marketing is valued more hight by B2C marketers than their B2B counterparts – make of that what you will. Public trust in the content they see published on social media isn’t particularly high right now, largely thanks to fake news scandals and increased awareness of people being targeted with content based on political, ethnic and all kinds of other questionable content. According to research by Pre Research Center, only 5% of adults strongly trust the content they see on social media. This isn’t only a political issue either; it’s a symptom of platforms emerging where brands and individuals can say or claim anything without needing to back it up. People are becoming wiser to this and simply telling buyers that your products or services are great doesn’t cut it. You need to earn their trust by showing them the quality and this largely brings us back to the topics of influencer content, third-party reviews, user-generated content and other crucial trust signals. Given the increased need to earn buyer trust and the success of influencer content across B2B and B2C niches, it shouldn’t surprise us to hear that 84% of marketers say they will launch at least one influencer campaign in 2018. This is according to research from Smart Insights. Influencer marketing isn’t necessarily as crude as paying some Instagram star to showcase your products or vouch for your services. It can be much bigger than that and the B2B arena, in particular, has a lot of room to develop this. Normally, it’s not the celebrities of social media icons that command attention in the business sector – it’s trusted industry voices and genuine business advice people want to hear. We’re way past the halfway mark for 2018 but the inbound marketing statistics and trends we’ve highlighted are going to shape content marketing well into 2019 and beyond. So now is the time to get your strategy in place for next year and make any adjustments you need to adapt to the latest developments. With search taking the lead in referral traffic once again, you’re going to want to pay extra attention to the changes happening in search right now – looking at ways to monetise the opportunities of voice search, the changing roles of publishing and advertising, plus the impact these have on user behaviour.